mark654ducks has no other items for sale. Details about #U362 STAMP COVER, UTAH NAT. BANK - HALL SAFE/LOCK CO.
#U362 STAMP COVER, UTAH NAT. 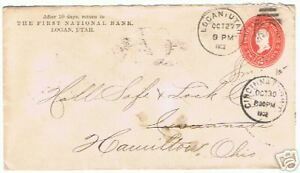 BANK - HALL SAFE/LOCK CO.
# U362, 2 CENTS US COVER / ENVELOPE ( COULD ALSO BE A U363,,,, ). FROM THE FIRST NATIONAL BANK, LOGAN, UTAH. TO. HALL SAFE & LOCK CO. HAMILTON OHIO. CINCINNATI, OHIO OCT 30 7-PM 1902,,,,,,,HAMILTON, OHIO OCT 31 7 AM 1902 REC'D.